WASHINGTON—Disability rights groups celebrated Thursday after the federal court for the District of Columbia handed down a ruling requiring all private businesses nationwide to install handicapped-accessible wheelchair jumps. 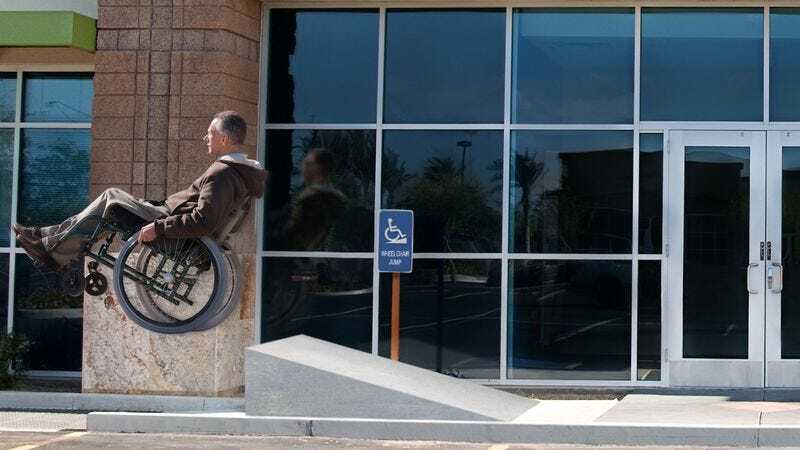 “This is a major victory for any disabled American who’s ever been prevented from performing a killer wallride or 360 bunny hop by the lack of proper handicap accommodations at a place of business,” said Alexis Pereira, a spokesperson for the American Association of People with Disabilities, adding that thanks to the ruling, wheelchair-bound individuals would finally be able to take full advantage of the nollies, table tops, and half cabs guaranteed by the Americans with Disabilities Act. “Until now, disabled Americans have had limited options for where to go to bust out badass G-turns and inverts. We’re hopeful that with this ruling, those with disabilities will never again be denied their constitutional right to shred.” Pereira added, however, that there was still a long way to go to ensure there were adequate wheelchair-accessible grind rails outside all government buildings.